Undead Labs' Jeff Strain apologizes, but there's little he - or the studio - can do. Undead Labs' zombie apocalypse title State of Decay has been doing astonishingly well on Xbox Live for a title with zero marketing budget, but even developers have to take the rough with the smooth once in a while, and it'd seem a recent Xbox Live update has caused more problems than it solved. The update had been intended to fix several known issues, including a bug where infestations were constantly reported no matter where on the map they happened to be, but - in the words of Undead Labs' Jeff Strain - "bugs we had verified internally as fixed were apparently not fixed on the live version of the game." Strain apologizes to all players affected by this issue. "There's nothing we can do at Undead Labs to fix this problem," he adds. "Once the update has been handed off, the process of getting it to you is something only the Xbox people can handle. So, we're calling in the troops to get going on solving this problem immediately." He acknowledges that this won't please everyone, and asks for patience. "You are OUR players," he says, "and we'd like you to know we're exploring ways to express our appreciation for your patience." Unfortunately there's no hard date for a fix. It's up to the Xbox Live people now, and Undead Labs has limited input on that end. 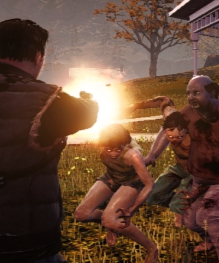 Patience - and possibly a loaded shotgun - are your best defences against this new zombie-related incident.